A full-time national serviceman (NSF) who is wanted by the Singapore Armed Forces (SAF) and fled from police while bleeding on from his left thigh on Sunday (Jan 20) has been arrested. The police told Stomp that the 22-year-old man was arrested along Woodlands Circle on Monday (Jan 21). Stomp previously reported that the NSF had suddenly bolted and fled when police officers conducted checks on him and another man at Block 365 Woodlands Avenue 1 at around 6.10am on Sunday. After conducting preliminary investigations, the NSF was found to be wanted by the SAF for being Absent Without Official Leave (AWOL). 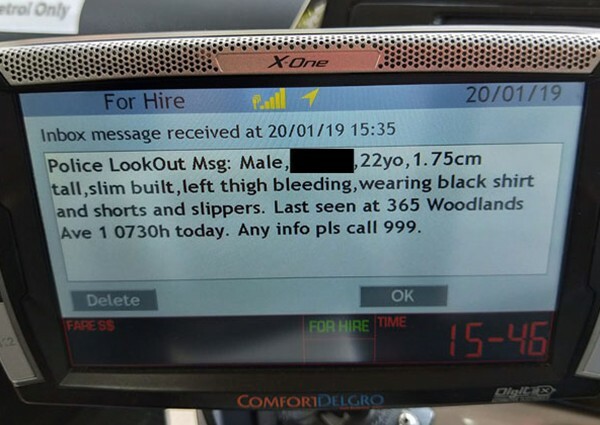 At 3.35pm, taxi drivers received a lookout message to keep an eye out for the man who was described as being about 1.75m tall, slim and wearing a black shirt, shorts and slippers.